Mount Frances’ rocky hulk sits immediately north of the Kahiltna Base Camp. Over a thousand climbers each year walk right around this peak without even giving it a thought. But this multifaceted satellite peak of Denali’s South Buttress holds some quality routes. The peak’s central location on the Kahiltna Glacier makes the views from its flanks and summit incredible. The summit is the best place to view all three of the Alaska Range giants from one location. As with many of the moderate routes around Base Camp, the Southwest Ridge of Mount Frances has been long overlooked by climbers more focused on the bigger peaks. It’s quite unfortunate because this long and fun mixed climb is a superb alpine challenge, similar in character to the more wellknown Southwest Ridge of Peak 11,300. Mount Frances is nearly as long but overall not as sustained or committing. The individual rock cruxes on Mount Frances however are more challenging than those on 11,300. 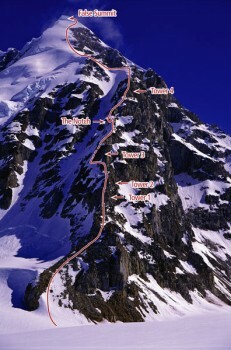 Given its proximity to Kahiltna Base Camp, this route is destined to become a very popular objective and range classic. Note: What looks like the summit from Base Camp is actually a false summit 400 feet lower and a half mile distant from the northern true summit. Which SuperTopo guidebooks include a topo for Southwest Ridge? An overview of the line.